Payment Gateway Vs Procesador de pagos | Chetu inc.
Payment Gateway is an application service provider that authorizes payments for businesses, online retailers or traditional brick and mortar. In simple terms, a payment gateway can be thought of as an interface between merchants and payment processors. The payment gateway accepts payment request from merchants and forwards this to the payment processor for further processing. Payment Processor is an entity that has direct interface to card associations or networks such as VISA and MasterCard. The payment processor receives payment requests from merchants or payment gateways and sends it to the card association or networks, which, in turn, route the transaction to the card issuing bank for authorization. Payment processors are also referred to as acquirers. The payment processor as a whole is a complete payment processing engine that processes real time transactions and end of day settlement requests and are also responsible for handling chargebacks from the Issuing bank. 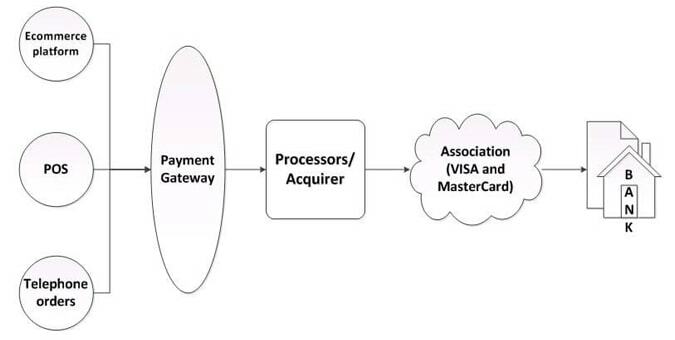 The diagram below shows a clear distinction between payment gateway and payment processor in a typical card processing system. As depicted in the graphic below, the payment gateway is a layer that sits between the merchant and the payment processor. While the payment gateway offers an easy integration to merchant applications, it comes as an additional cost to the merchant. The merchant can save this additional cost by integrating directly to the payment processor. While this is true there are several other factors that should be considered when choosing between payment gateway and payment processor. Total Transaction Volume: The payment processors have different transaction fee rates that depend on the volume of transactions. Most of the payment processors offer lower rates for high volume of transactions. It would be more feasible for small businesses to go to payment gateway that have small volume of transactions. Integration Cost & Time: The development cost and time for integrating with payment processor is higher as compared to payment gateway integration. The Payment processor requires integration to their ISO 8583 platform and undergoing their certification process. Compliances: Integration to payment processor requires a PCI certified infrastructure and adherence to all compliances set by the card association network (VISA and MasterCard). The payment gateway on the other hand deals with all the intricacies related to ISO 8583 integration and the payment processor certification process. The time and cost associated with payment gateway integration is much lower as they offer a simple API layer for accepting and processing payment requests from merchants. Settlement: The payment gateway handles the settlement on behalf of merchant while the payment processor expects the merchant to send the end-of-day settlement request and handle the settlement file to be imported back into the system. Through our extensive experience with projects related to payment gateway and processors, we have seen an emerging convergence between the POS and payment gateway industry. The POS industries are leaning towards implementing their own payment gateway to get a cut of all the transactions that are processed via the POS. Conversely the payment gateway industry is looking to build their own POS systems to process all the transactions originating from the POS system. Chetu, Inc. no afecta la opinión de este artículo. Cualquier mención de nombres específicos para software, compañías o individuos no constituye un endoso de ninguna de las partes a menos que se especifique lo contrario. Todos los casos de estudio fueron escritos con la cooperación, el conocimiento y la participación de los individuos mencionados. Chetu se incorporó en 2000 y tiene su sede en Florida. Entregamos Soluciones de Desarrollo de Software de Clase Mundial sirviendo a empresarios a clientes de Fortune 500. Nuestros servicios incluyen diseño de procesos y sistemas, implementación de paquetes, desarrollo personalizado, inteligencia empresarial e informes, integración de sistemas, así como también pruebas, mantenimiento y asistencia. La experiencia de Chetu abarca todo el espectro de TI.